I went for an interesting run last night, in the dark, rain and fog over the Downs.... It wasn't that cold but it was pretty muddy in places ! 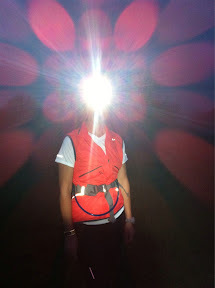 The run was partly to test quite how good my head torch is and also to try eating Clif Shotbloks whilst running. Anyway, back to the run.... We didn't see another person whilst on the Downs, not surprising really ! We did however scare several pheasants and other birds. On the last downhill section they have cattle grazing as part of a downland scheme; this means that the paths have been really churned up and were incredibly muddy. We did walk part of this section, a mixture of mud, rain and chalk is not good to run on especially without spikes... I still ended up on my bum in the mud at one point, no serious damage done though !